This is the As Tumbo Elementary GATE website. Click on a link to learn more about our school GATE program and what we have been doing in and out of class. Our GATE kids that registered for the Math Kangaroo Competition visited the Guam Community College Campus to compete with students from the other elementary schools in the same grade levels. Our very own Oliver and Natalie were interviewed by PNC News about this very special event. Check out the Picture Gallery to see the students participate in the Math Fest (carnival) that followed. The different grade levels are conducting engineering challenges and learning science concepts that range from centripetal and centrifugal force to center of gravity and friction to sound traveling. Check out the picture gallery to see what they are up to in class. Kindergarten is exploring geometric shapes and hunting for them in our school. Ask them about a parallelogram or the rhombus they found on the playground. 1st grade is finding patterns in numbers. 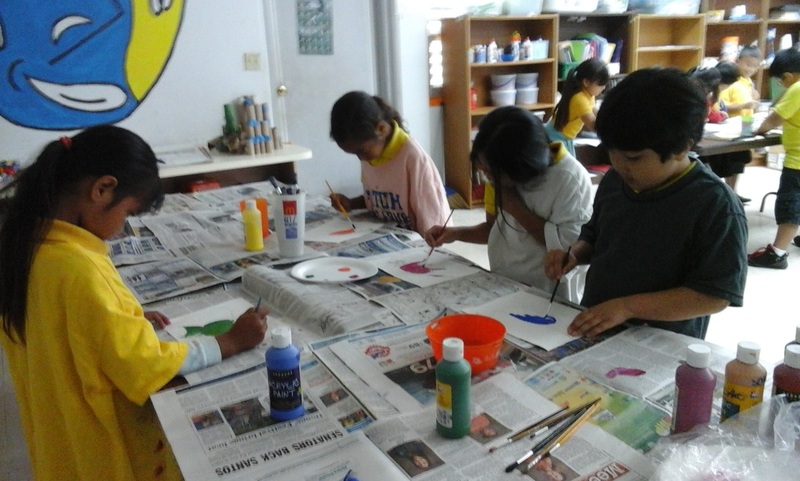 2nd grade is drawing and painting dinosaurs on canvas. Ask them some fun facts about dinosaurs. Some fun and helpful links. Here are some links that can be useful and fun. AsTumbo Elementary School Website will keep you up to date on what is happening at our school and in the regular classrooms. Guam GATE Our GATE Program website where you can get more information about our program, events, and helpful websites. Merriam Webster Dictionary can be used to look up unfamiliar terms and is used by Scripps National Spelling Bee as the agreed upon source for spelling and definitions. E-Learning for Kids is a great website for exploring different subject areas. Hoagies is another GATE website that useful information and activities for gifted children as well as helpful tips for parents. Code.Org introduces students to simple coding. Kidsclick is a website designed by librarians and includes kid friendly information on a wide range of topics. Ducksters and Fact Monster are two websites for learning information, especially for younger grades. National Geographic Kids is fun to explore and learn and provides kids with videos, pictures, and games to choose from. Khan Academy covers a wide variety of subject areas and offers tutorials. Are penguins clumsy? Why are skunks black and white? Check out Discovery Kids and find out. The site includes activities, games, and fun facts. Math Olympiad for Elementary provides practice problems for math olympiad students. Interactive Sites for Education is a Weebly site that provides links to interactive games teaching about scientific classification and taxonomy.